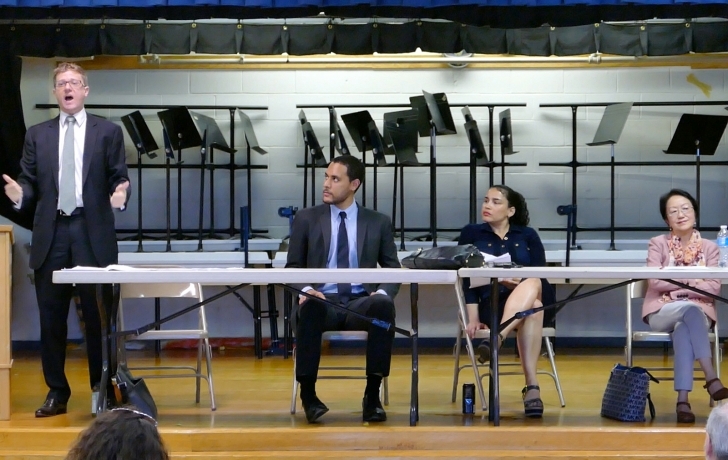 City Councilwoman Margaret Chin faced her three Democratic challengers in Tribeca earlier this month as she sought to defend her two terms in office and make the case for a third. At the contentious Council District 1 candidate forum, sponsored by Tribeca Trust and held at P.S. 234, the three opponents—Christopher Marte, Aaron Foldenauer and Dashia Imperiale—tried to link Chin to real estate interests at the expense of the community. “I would like to listen to the constituents and not to the developers,” said Imperiale, 50, a self-described activist and “rabble rouser” from the Lower East Side who announced that she wants to “undo everything that Margaret has done.” Foldenauer, 41, a non-practicing lawyer and Financial District resident, lumped Chin with politicians “awash in real estate money.” Marte, 27, a former investment analyst from the Lower East Side who has emerged as Chin’s chief rival, painted the councilwoman as inaccessible and out of touch with her constituents. Amid the verbal pummeling, a stone-faced Chin stared forward, rarely looking at her opponents and often shaking her head. For her part, she claimed a record of tenant advocacy and demonstrated support for affordable housing. “I’m running on my record and also my community activism of 40 years,” said Chin, 62, who founded the advocacy organization Asian Americans for Equality. This was the second forum where the candidates appeared together and, like the first, Chin drew criticism from her opponents and from Village activists in the audience for her support of a plan to build below-market senior housing on what is now the Elizabeth Street Garden. As in the past, she cited the city’s homeless crisis. “We need all the affordable housing we can get,” she said. Tribeca Trust president and forum moderator Lynn Ellsworth asked Chin why she had advised her group to advocate for a phased expansion of Tribeca’s historic districts, when the neighborhood as a whole was losing historically important buildings. Chin said that Tribeca is competing with many other requests from around the city. “My colleagues in the City Council are also pushing for historic districts and landmark buildings in their districts,” she said. Chin took credit for halting a city plan to sell its building at 137 Centre St., where a developer could purchase the air rights of 87 Lafayette Street (the media arts center DCTV) and build a mixed-use tower as high as 60 stories. Imperiale said she would “undo” two programs “that only benefit developers”: 421-A tax abatement legislation, updated in 2015, which affects new residential construction, and an inclusionary zoning program that gives developers permission to add height to their buildings in exchange for a percentage of below-market apartments. Marte named three goals: He said he would support campaign finance reform legislation; give small business a “fighting chance” to renew their leases through the Small Business Jobs Survival Act; and better engage with constituents—by way of town hall meetings, and with participatory budgeting, an arrangement that gives constituents a voice in where their council members spend discretionary funds. Foldenauer focused on Tribeca's landmarking and its four historic districts. “I will push for landmarks rulings and legislation that would make Tribeca a single historic district.” He also railed against absentee apartment buyers who don’t pay their “fair share” of state and city taxes. Chin used her time to recount her accomplishments, saying that she preserved and created hundreds of affordable housing units on the Lower East Side and protected Independence Plaza seniors from being “downsized” into smaller apartments. She also noted that she had helped pass legislation for crane safety following a fatal accident last year on Worth Street. “I’m proud of my record in the City Council,” she said. According to the most recent candidate filings released by the city’s Campaign Finance Board, Chin is leading in contributions with $97,336 and $71,544 on hand. Marte, her closest rival, has raised $69,324, with $56,519 left to spend. Foldenauer’s contributors have donated $21,942 to his campaign, and $9,627 remains. Finally, Imperiale has $12,161 in remaining funds from the $12,347 she has so far received.